The popular football folklore suggests that Jurgen Klopp hasn’t won any significant cup in his career as manager, which is a bit overrated statement as he has actually won DFB-Pokal in Germany with Borussia Dortmund, the equivalent of the English FA Cup. He has subsequently lost two Champions League finals – one with Borussia Dortmund against Bayern Munich and one with Liverpool against Real Madrid. In his first two seasons with Liverpool, he has also led the Reds to a UEFA Europa League league finals lost by Liverpool by 1:3 to Seville. What do all those lost finals have in common, besides the fact that Klopp was in charge of the teams who lost them? It is that Bayern Munich, Sevilla and Real Madrid were superior to the Klopp teams in all three occasions. It is fair to say that Borussia Dortmund have been at the same level with Bayern Munich in the German Bundesliga. However, during the Champions League final they have played against the Bavarians, and it was a bit unfair for Jurgen Klopp led team, who played very good in the final that Arjen Robben has scored a goals in the 89th-minute. That’s football, however. In the other two occasions Liverpool weren’t better prepared than Seville and Real Madrid to win the tournaments and have been considered as underdogs on both occasions. It was the same for the Reds in the Premier League since 2010 when Rafael Benitez left the club. The season 2008/09 was the last one in Liverpool’s Premier League history when their team was built to compete for title and was predicted to be one of the contenders to win the league. Someone would point to season 2013/14 when the exceptional at the time striking duo Lusi Suarez and Daniel Sturridge led Reds to the second place and the league and Liverpool have effective chased for the title. However, this was a Reds team who wasn’t considered as title contender at the beginning of the season. The individual qualities of some Liverpool players allowed the team to compete for the top spot. The Reds manager at the time Brendan Rogers was lucky to have exceptional players like Luis Suarez, Daniel Sturridge and Steven Gerrard in his squad, but failed to prepare and manage his team to win the league. It would be a bit unfair to blame on Rogers for the missed opportunity, but the fact was that he was in charge of the team and his game management in the most important fixtures didn’t deliver results. What is different for Liverpool in season 2018/19? I have now idea how Liverpool would start the season at home against West Ham on Sunday, 12th of August as this article has been published few hours before the game. From what I have seen in the Liverpool pre-season games, Red must be a much stronger squad than they were last season, they must create more chances and must score more goals than they did in the Premier League 2017/18. The reason for that is Jurgen Klopp have bought well in the summer. 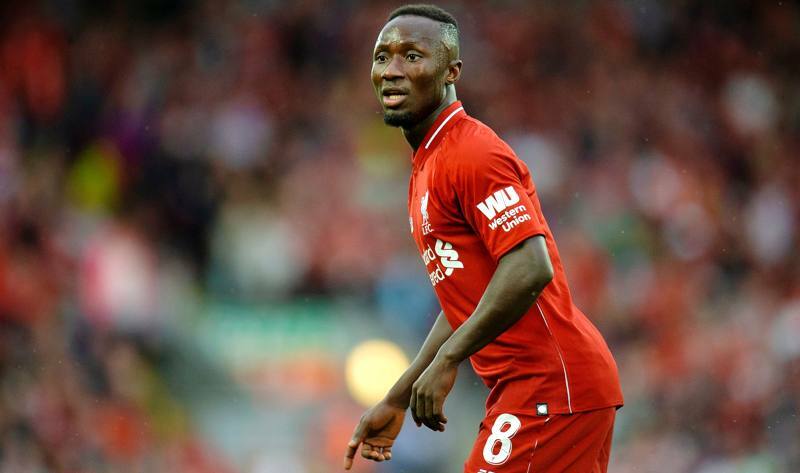 Naby Keita who joined the Reds from RB Leipzig and Fabinho who came to Anfield from Monaco, are nothing less but exceptional midfielders, who will improve even further under Jurgen Klopp’s management. Both of them have a great pace and are very skillful on the ball. Both of them are fast universal box-to-box midfielders who play in a very intelligent way. When Liverpool are expected to defend both would help the team to close the spaces in front of the Reds defence much better then Wijnaldum, Henderson and Emre Can or James Milner has even done that last season. After Xabi Alonso left Liverpool for Real Madrid in 2009 – those are nine Premier League seasons – Reds have never had a world-class number 6. the Liverpool have needed someone who would organize their midfield when the team needs to defend and at the same time to go forward and pass the ball well when the Red go into attack. Both Keita and Fabinho are capable of doing that alone or as a pair in the Jurgen Klopp Liverpool’s midfield. Keita and Fabinho have impressed in the preseason and it looks like that Liverpool would finally have a midfield that levels the quality as their striking trio – Sadio Mane, Roberto Firmino and Mohamed Salah. Allison Becker is probably the world’s best goalkeeper and Liverpool have a world class player on this position for the first time within the last two decades. This means a lot. Allison is expected to bring the much needed confidence to the Reds back-four, something which the Jurgen Klopp’s team missed within the last two seasons. Another good news for the Reds is that Daniel Sturridge is returning to his best, so they are supposed to have more options in their attack. Manchester City are still considered as better prepared to win the Premier League title. Any reasonable projections suggests that it is less risky to project that the current Pep Guardiola’s managed Man City team, who know their game and have been raiding the other Premier League’s defenses last season, would win a second consecutive title in the English top-flight. There’s one thing which goes in favor of Liverpool, however. The Liverpool players are hungry for trophies and it looks that it is the right time for them to win. Liverpool have had a very good team last season, but clearly not the one they needed to win the league. They have missed few top midfielders goalkeeper and another world class central defender to partner to Virgil van Dijk. After the summer transfer window has closed the only part of the Liverpool’s team which would be considered as a bit weak is the defence. Jurgen Klopp hasn’t found a partner of van Dijk and obviously thinks that Dejan Lovren, Joel Matip and Joe Gomez are good enough to partner the Dutchman. The last season was good for Dejan Lovren and he didn’t loose time to proclaim himself as “one of the best defenders in the world”. However, considering all the mistakes he has made paying for Liverpool in the past few seasons, Lovren’s self-confidence could cost Liverpool some important points this season. However, Klopp is probably right to refrain from buying another central defender in the summer as Virgil van Dijk has integrated very well with the squad and improved Liverpool’s defence a lot. It makes sense for Klopp to see whether a defence led by the Dutchman would be a stable enough. If it is not Liverpool could go and sign a new central defender in the winter transfer market. Managers use to say that it is quite hard to sign a top quality players in the winter transfer market, but FSG have turned Liverpool FC into a money-making machine, it would not be a problem for the Reds to smash the world transfer record for a defender, a second year in a row and to bring a partner to van Dijk, if they need to do that. What to expect from Liverpool this season? The first thing is that the Reds players will move the ball even faster then they did last season. Unlike the 2017/18 campaign, they would not depend solely on Mohamed Salah and Sadio Mane performances on the flanks to open the oppositions’ defences. If any of them does not play Daniel Sturridge can step into his feet and be very successful in the Liverpool attack. Tactically it would not be hard for Jurgen Klopp to reshuffle the way the team plays and to go from 4-3-3 to 4-2-1 3, to 4-1-2-3, to 4-4-2 or even to play with 4-1-3-1 formation. Another thing to expect from Liverpool this season is to score goals while conceding less. We will see how the Klopp’s new football machine will fare in their opening game against West Ham. If they win on a landslide against a Hammers’ team that defends well, we’d expect them to score even more goals in season 2018/19, than they did the last one.